Twenty-fifteen was an unexpectedly historical year for Yellowstone National Park visitation. The number of people coming to the world’s first national park jumped 17 percent and crossed the 4 million mark for the first time. “Seventeen percent is a pretty big shock to the system,” said Ryan Atwell, social science coordinator in the park. Rangers issued more than 52,000 resource warnings, up 19 percent from 2014, for behavior including getting too close to wildlife and threatening thermal features by leaving the boardwalk. 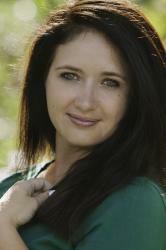 Motor vehicle accidents with injuries increased 167 percent. Search and rescue responded to 61 percent more calls. Wildlife jams created two-hour waits. Bathroom lines ran 40 people deep. 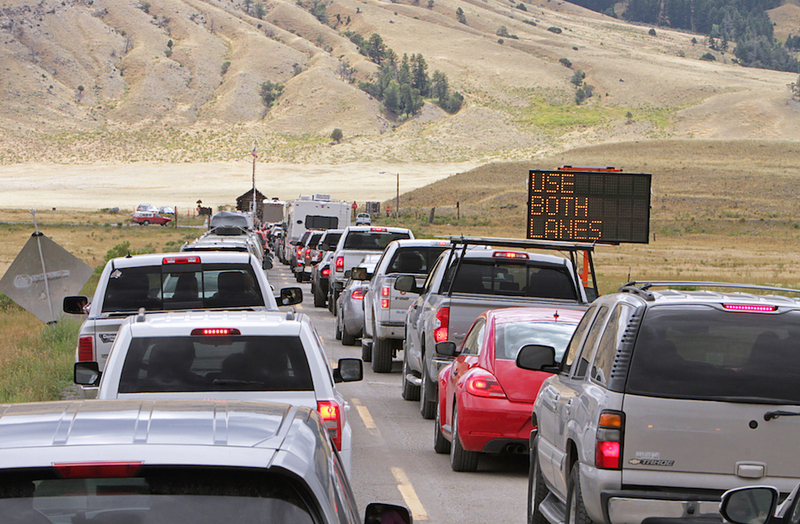 The West Entrance queue snaked the streets of West Yellowstone, Montana. Unprecedented crowds descended from tour buses onto popular sites. With campsites full, people slept illegally and turned pull-outs into public bathrooms. That was last year. 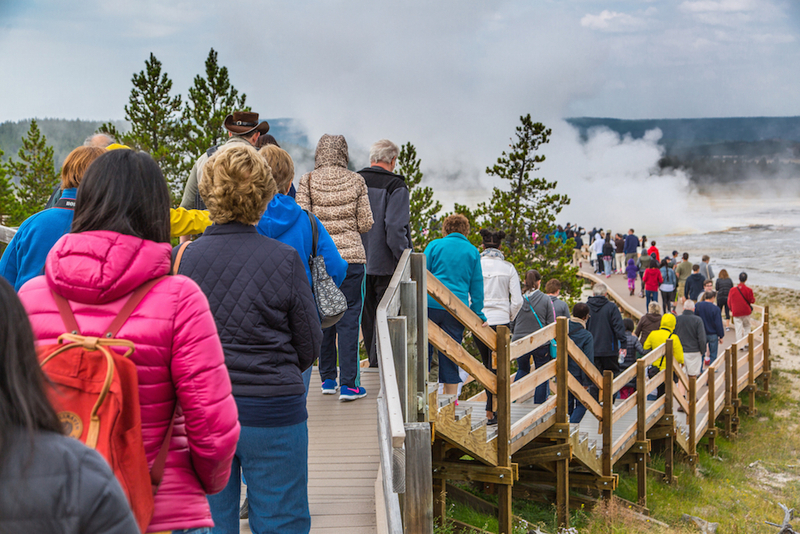 This year, which marks the National Park Service’s Centennial celebration and saw an entire issue of National Geographic Magazine devoted to Yellowstone, is expected to be even busier. 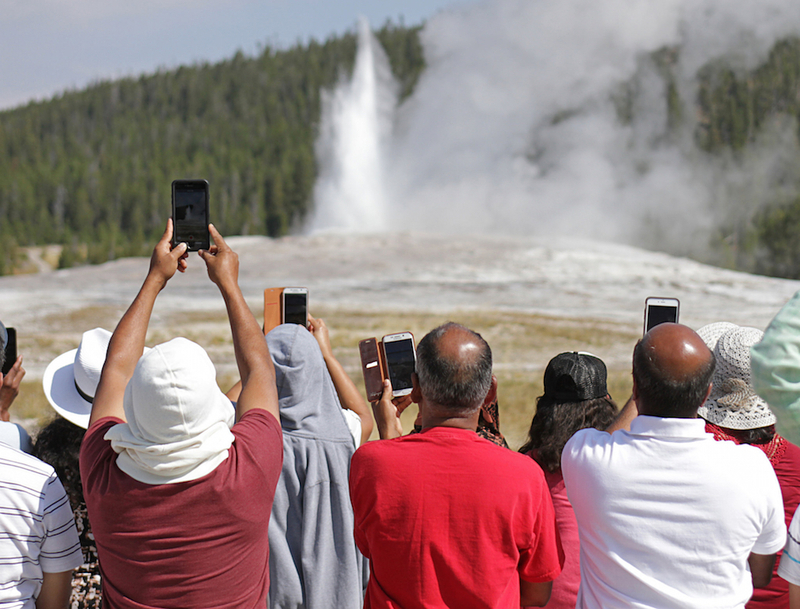 And if the early season headlines are any indication — visitors picking up baby bison, tangling with an elk, leaving the boardwalks for pictures and falling into thermal features — the park can expect even more human hijinx. That’s where Atwell comes in. Most of the research in the park studies Yellowstone’s ecology, wildlife, thermal features and vegetation — not people. Last August Atwell started studying how humans use and experience Yellowstone, hoping to provide data to managers so they can better respond to the record crowds and their increased demands on the park and its resources. Never miss a Peaks to Plains. Subscribe for free now. Atwell interviewed park staff to learn what they noticed with increased visitation in the park. If congestion was an issue, Atwell wanted to know where it was the worst. If the Old Faithful parking lot was overwhelmed he wanted to know when, how long it was full and how people behaved. “It was about operationalizing the problems,” Atwell said. “The most nimble thing to do in the short term is put more boots on the ground, but it’s not that easy with the park service,” Atwell said. “We’re kind of crippled in that sense.” Park staffing has remained relatively unchanged since the mid-1990s due to limited federal funding. The park used Atwell’s data to try to prepare for this summer. It installed more bathrooms and trash cans in heavy-use areas. Managers adjusted seasonal hiring to account for workers who leave before the summer’s over. 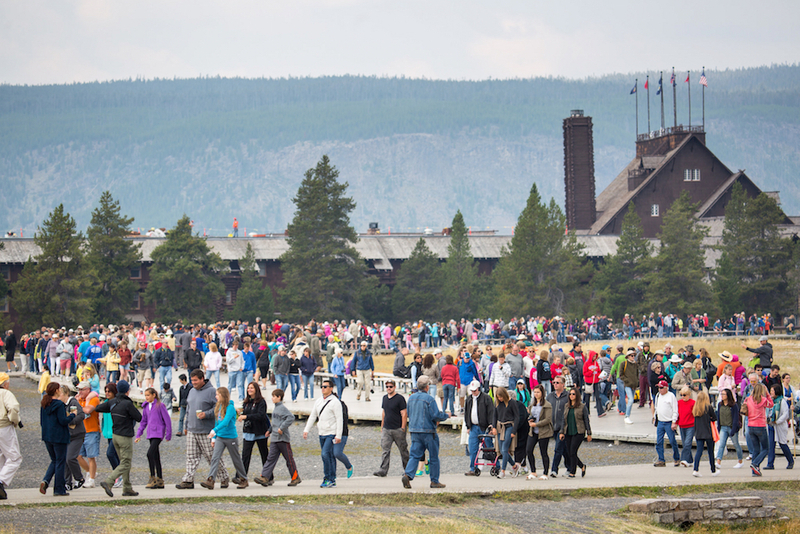 Atwell will survey visitors this August during the busiest time of the year in Yellowstone. He wants to know where visitors are coming from, how they are accessing the park and what languages they understand. If someone doesn’t read English, how can the park get safety information to them? “Yellowstone is emerging not just as a domestic area of importance, but a global attraction,” he said. There will always be people who ignore the park’s rules (most incidents this year involved Americans and Canadians who understood English signs perfectly well) and more people means more rule-breakers, Atwell said. Some people are so focused on their phones they don’t look where they are walking. Those politely waiting to avoid crashing a family photo back-up the lines on the already crowded boardwalks. Understanding this type of behavior can help the park deal with it, Atwell said. 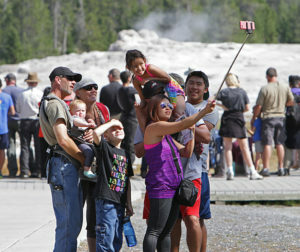 Yellowstone could build additional pull-outs on the boardwalks where people can take pictures and not add to the congestion. Atwell also wants to better understand what brings people to the park and how they feel about the experience, including specifics on how long and where they are stuck in traffic. This type of data can guide the park’s planned transportation study, which will look at the physical capabilities of the roads, law enforcement response times and the cost of public transportation used in places like Zion National Park to limit the number of personal cars in the park. Atwell believes, and tries to remind people, that the increase in visitors isn’t all bad. “The demand means more and more people want to come to Yellowstone and that’s awesome,” he said. He is still astonished he can watch wolves with 200 people on the side of the road and everyone is well-behaved. If you are willing to get out and hike a half mile, you can still find solitude in the backcountry.